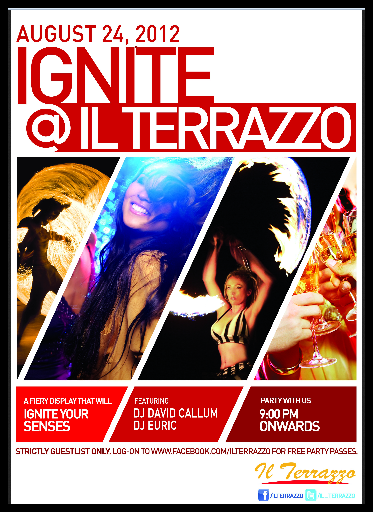 IGNITE @IL TERRAZO, a fiery display that will ignite your senses. We will be giving away 5 VIP tickets to this event! 3. (on Facebook) Post the photo and caption "IGNITE @Il Terrazzo (http://www.facebook.com/IlTerrazzo) and Party with DJ CALLUM DAVID, DJ EURIC LUMANOG and GINO QUILLAMOR OF RX as we launch the newest lifestyle hub in the Metro!" 4. (on Twitter) Tweet "IGNITE @Il_Terrazzo and Party with @callumdavid1, @djeuric and @ginoboi as we launch the newest lifestyle hub in the Metro!" 5. Random winner will be chosen FRIDAY MORNING! 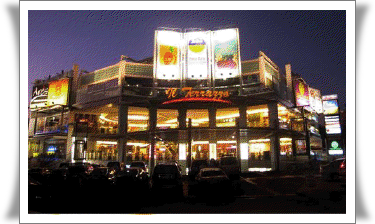 IL TERRAZZO.. the talk of the town lifestyle hub!! You're the best..